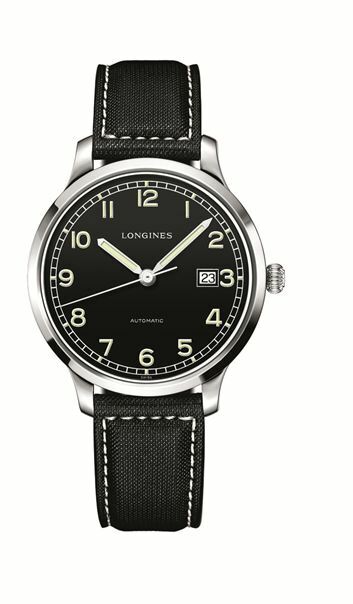 Based on designs for military watches produced in the 1930s, the models in the Longines Heritage Military 1938 line have retained the characteristic simple appearance of the original design. Ensuring easy reading, the large white Arabic numerals and the minute circle are in stark contrast to the deep black of the dial. 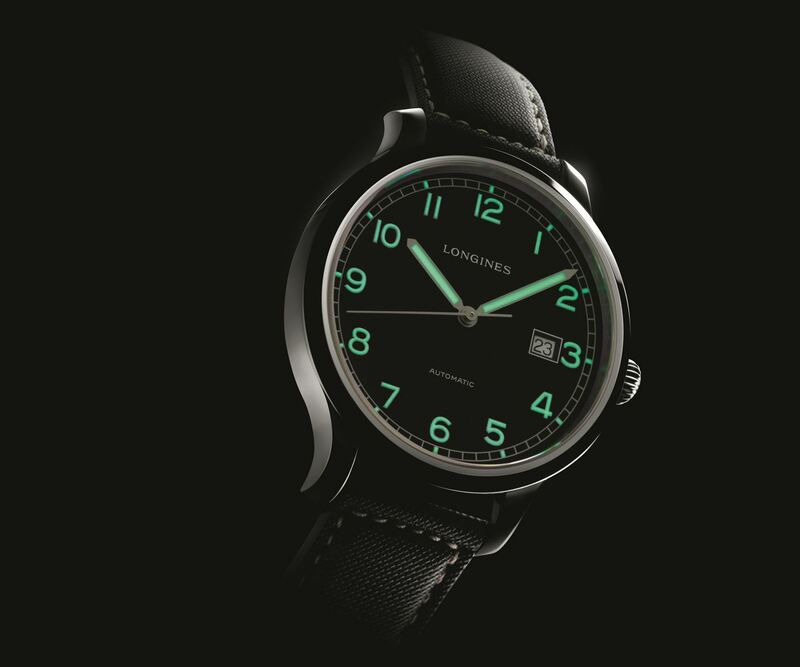 For easily legibility even in poor light, the Super-LumiNova® coating on the hands and the numerals provides subtle green tones which lend this model, strength of its own. The fluted, flat crown, which accentuates the 1930s look, is a direct reference to the original design. 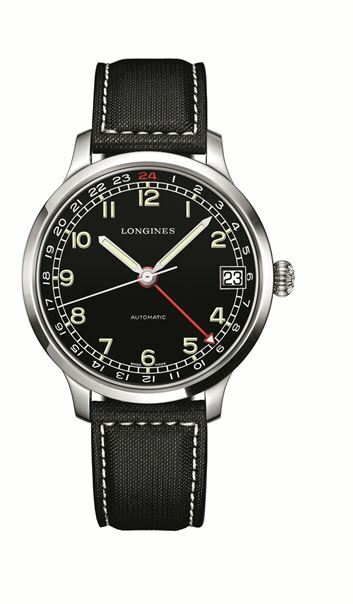 The black synthetic strap stitched in white, adds a subtle touch of contrast in the Longines Heritage Military 1938. 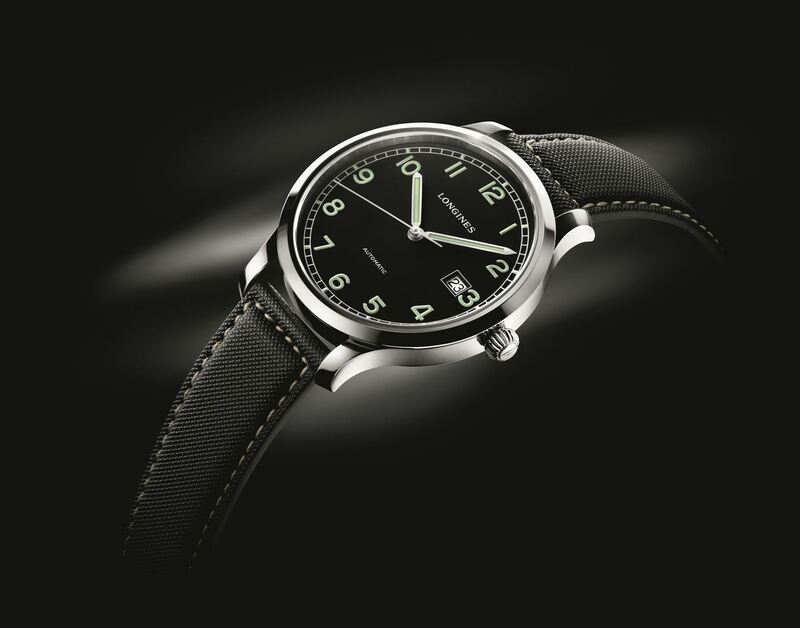 The Longines Heritage Military 1938 is available in three versions, all in steel. With its simple design, the model with 3 hands has a 40 mm diameter case and is the closest in design to the original product. 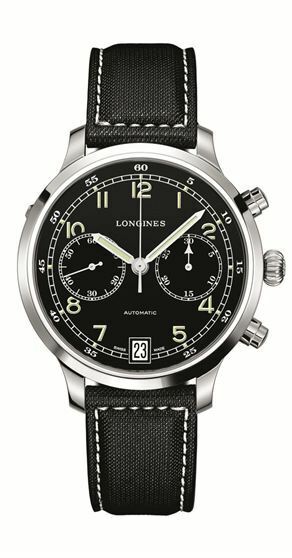 The black dial is decorated with twelve white Arabic numerals surrounded by a railway-track minute circle and displays the date at 3 o’clock. With a diameter of 42 mm, the 24-hour version is immediately impressive thanks to the bright red hand for the second time-zone which stands out clearly against the black dial. The 24-hour scale has been added on to the flange around the railway-track minute circle and the date display is at 3 o’clock. Retaining the same sleek lines, the chronograph has a 30-minute counter at 3 o’clock, a date at 6 o’clock and a small seconds at 9 o’clock. With a diameter of 40 mm and fitted with the automatic calibre L619, this timepiece displays the hours, minutes, seconds and the date at 3 o’clock. Large white Arabic numerals, coated with Super-LumiNova® and a minute circle white as well contrasts with the deep matt black of the dial. A black synthetic strap, stitched in white, adds a final touch to this new model. With a diameter of 42 mm and fitted with the automatic calibre L704, this timepiece displays the hours, minutes, seconds and the date at 3 o’clock, as well as a second timezone with a bright red hand. Large white Arabic numerals, coated with Super-LumiNova® and a minute circle white as well contrasts with the deep matt black of the dial. A black synthetic strap,stitched in white, adds a final touch to this new model. With a diameter of 42 mm and fitted with the automatic calibre L705, this timepiece displays the hours and minutes, a 30 minutes counter at 3 o’clock, the date at 6 o’clock and the small second at 9 o’clock. Large white Arabic numerals, coated with Super-LumiNova® and a minute circle white as well contrasts with the deep matt black of the dial. A black synthetic strap, stitched in white, adds a final touch to this new model.